Mother’s Day started early this year. At Danny’s morning preschool, they had a Mother’s Day Spa on the Thursday before Mothers Day. It was held from 12:15-1:15 pm. Normally Danny goes to his special needs preschool at 12:25, so he does not spend the last hour of his morning preschool with his classmates, but instead takes a bus to go to his special needs preschool, where class meets in the afternoon and he receives therapy from a few different therapists. At first I didn’t realize the importance of attending the Mother’s day spa. I figured I could miss this, so Danny could get to his afternoon preschool and not miss any of his pull outs. But the teacher was persistent in making sure everyone RSVP’d. She even suggested sending an aunt, grandma or special female friend if the mom could not make it. That made me realize it wasn’t just about me, but about Danny giving to his mom, just like his other classmates at the Pre-K Mothers Day Spa. They had secretly been preparing for weeks. The first thing they did was present their mom with a tissue paper flower which they had made previously. This is as we waited to go into the spa. I arrived early, since I didn’t want to miss anything. It was a lucky thing, since the teacher told me later that some of the children were getting anxious if their mom’s were late to this great Mother’s Day Spa. 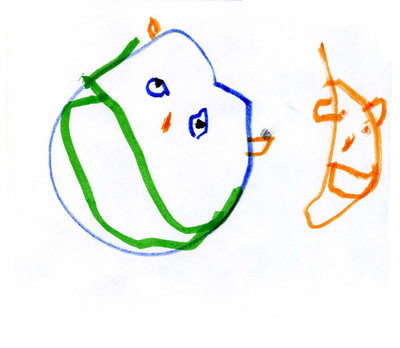 The children had made a picture of Mom and child and then answered questions which the teacher had written down. 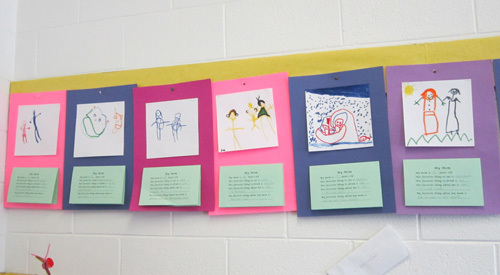 They were all hung on the wall and you had to open it to see what child did what picture and answered the questions. Danny said “My mom is 4 years old.” (He is so kind). My favorite food is macaroni and my favorite drink is iced tea. I think he got the last one right. He said that my favorite thing about him is “his short sleeve shirt”. (I think I must had said “I like your shirt.” before we went to school the morning he answered that.) In that same vein, his favorite thing about me is “my purse”. Of course I am old enough to remember Art Linkletter’s House Party and the funny things children said on that program. This was my first spa experience; perhaps it is not quite like the Red Door Spa or Spa Mesu. It started off with mom’s going to different stations. I sat in one tiny chair with my feet propped on another tiny chair and Danny put cucumber slices over my eyes while I relaxed. While the relaxing was taking place, Danny massaged my hands with lotion. He stopped at one hand and had to be encouraged by the assistant teacher to do both of them. Of course with cucumber slices over my eyes, I couldn’t see what was going on or take any pictures. Then it was on to the food table. Danny took a plate and served me watermelon cubes, and chocolate pretzels, which they had made the previous day when I cooped. He was very good at making sure he used the serving spoon to serve me those watermelon cubes, even if it meant picking up the watermelon cubes that had fallen on the tablecloth. We sat down to eat and drink green tea. Then it was on to the nail spa station. There was only one color nail polish not being used when we got to the nail table. It was clear. I would be fine with clear, but Danny had other ideas. His classmate Colette was painting her mom’s finger nails an alternating pattern of pink and silver. Danny waited until she was done, so he could do the same fabulous pattern on my fingers. It was pretty clear they had been studying patterns in Pre-K. According to the teacher, this is the part of the Mother’s day spa that they didn’t practice. I thought Danny did a great job! And it is a great exercise to do for occupational therapy! After that we went to the picture taking station where the assistant teacher was taking Mother and Child pictures. She had to take several with a wiggly four year old. We got the picture a few days later in a little cardboard frame which some children had decorated. Danny went with the plain frame for his mom. After more eating, the class got together in a circle. Mom’s sat on the spot on the rug with their child’s name and the children stood behind the mom’s. They gave us back and head massages as they sang the song ‘A Ram Sam Sam’. After a massage, came the time for presentation of gifts. 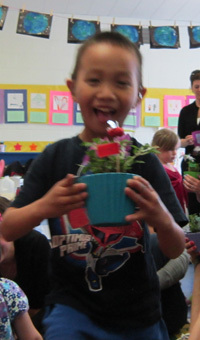 Each mom received an impatiens flower planted in a planter the child had painted. Danny was so proud of his gift. Lastly the class sang a song for all the moms. It was obvious they had practiced this performance. I don’t think I could enjoy a spa more than I enjoyed this spa from Danny at age 4! After it was all done, I drove Danny to his afternoon preschool and signed him in late, excuse: Mother’s Day Spa. I could have really messed this one up if I had not realized the importance of showing up for this event. I don’t normally wear nail polish, but two weeks later I still have the remains of the nail polish (that alternating silver and pink pattern) on my nails. I think my mom would have removed it when she got home and it would have hurt my feelings. I decided to keep it on until it wears off. This entry was posted in mother's day and tagged mother's day. Bookmark the permalink.